The Center Dome sustained damage on Feb. 24 and is currently unavailable for use. For more information on rentals please contact Mike Kult at 402.554.3232 or wkult@unomaha.edu. Located on the Center Street Campus (68th & Spring St.) the Indoor Dome has more than 43,000 square feet of field turf and is available for rent and open recreation hours. To request a dome rental please fill out the online form. For more information on rentals please contact Mike Kult at 402.554.3232 or wkult@unomaha.edu. $55/Hour plus cost of lining fields if applicable (cost to be determined). The sliding rate scale is determined by the total number of hours contracted annually by the renter. Off season rates May1 to October 31 and indoor season Nov. 1-April 30. UNO students, faculty, and staff can request a room in H&K by filling out the online request form. Please complete the form at least 24 hours prior to your requested time. Requests will NOT be approved over the weekends so please submit request(s) for weekend and Monday activities by end of the day Thursday. Thank you, if you have any questions, please email unocampusrec@unomaha.edu. 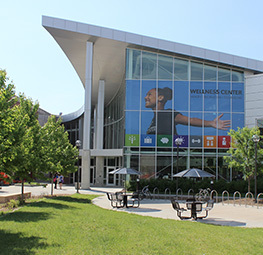 In an effort to better serve our campus population and the Omaha community as a whole, many of the UNO Campus Recreation facilities are available to rent. In accordance with our mission and goals we offer a tiered fee base in order to best serve our primary audiences. UNO Organization may reserve space at no charge if all participants are UNO students, faculty and staff. If non-UNO participants will be attending the event, a rental fee will apply. $25 set up and clean up fee may apply. *Tables and chairs are available upon request at additional charge. For more information on rentals please contact Mike Kult at 402.554.3232 or wkult@unomaha.edu. Locker rooms feature showers, restrooms, rental lockers, sauna and steam rooms. Available to students, faculty/staff and Campus Recreation members. Separate areas are designated for faculty/staff and students. Inclusive locker room is also available. Fine tune your archery skills or your golf game with our FREE golf and archery lab. Equipment is provided as needed and a supervisor is available during open hours for training and safety tips. Lab is located in the lower level of 003 H&K next to the racquetball courts. Tuesday/Thursday 5:30 P.M. - 6:30 P.M.
Friday 12:00 P.M. - 2:00 P.M. If you are attending a Wellness Center program on campus Monday — Friday, you will need to obtain a parking pass to avoid receiving a ticket. For more information on UNO Parking Services, view parking maps on campus or call 402.554.PARK (7275). The H&K building completed a $38.6 million dollar renovation in October of 2010.